Tired of endless online dating questionnaires and compatibility tests? 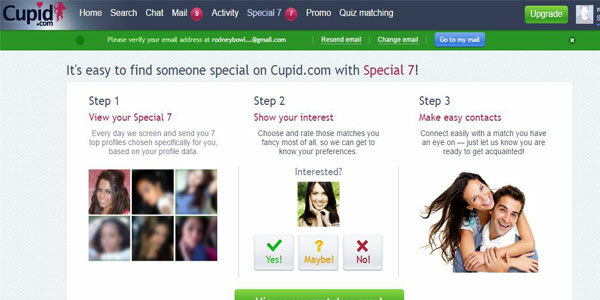 Cupid.com takes an entirely natural approach to finding someone special online. The emphasis is on interacting with other users to decide for yourself whether you are right for each other. With plenty of tools, the range of chat rooms provides a great chance to meet people, while “multiflirt” is a great feature which enables you to reach out to multiple users at once. This is a dating site which will keep you busy. For a start, there are so many ways to communicate with other users. In addition to private message and instant chat, you can send a “wink” or enjoy audio and video chat with anyone who catches your eye. 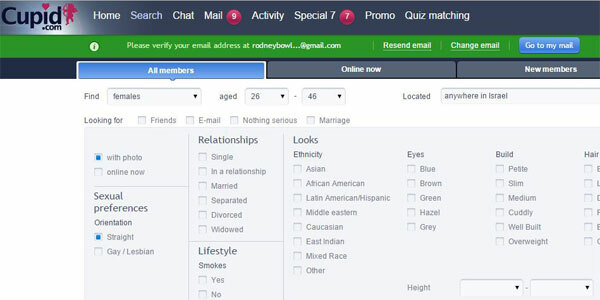 By sending a “multiflirt,” you can tell numerous users that you are interested in them with just a simple click. The chat rooms provide the chance to get to know other people and the discussions are not only confined to dating and relationships. You can also find forums dedicated to music, art and more. Meanwhile, you will find a greater range of profile options at Cupid.com than you are likely to find elsewhere, giving you an even better chance of catching someone’s eye. In addition to a bio and photos, you can include webcam recordings and rate your character traits such as patience and caring nature, on a scale of 1-10. When it comes to casting the net and finding someone, check out the “Special 7” and “Daily Top” features which will both suggest possible matches. Getting started is very simple. 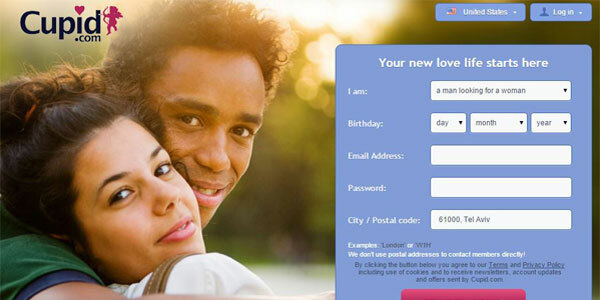 The Cupid.com sign up process will take you just a few short minutes. You will be asked for some very basic information, such as gender, date of birth, location, plus a valid e-mail address and password. You will then be sent an e-mail with a link to verify that you are a valid user. Once you log in, you will be handed the chance to upload photos, select a screen name and tell other users a little more about yourself. Although like any other dating site, Cupid requires you to divulge some personal information, you should have no worries about it ending up in suspicious hands. The information you submit will not be shared, while the e-mail verification helps eliminate scammers. And just to show how seriously the site takes online safety, there is a whole page dedicated to tips for dating both online and offline, which are well worth reviewing. For a start, women need not pay a cent. That’s right, women can sign up for free and enjoy full usability of the site. However, men will need to decide whether to remain a free member or not. In reality, free members are very restricted in their activity. They cannot view profiles in their entirety and “winking” is pretty much the only way to communicate. So if you are serious about meeting someone, it is worth becoming a paid member. If you want to check things out, then the 3-day trial for $10 is worth considering. Meanwhile, a 1-month deal costs $29.99, but the multi-month packages see the cost fall significantly. A 3-month package will cost you $17.99 monthly and a 6-month deal costs just $11.99 per month. The whole site is geared towards interacting and this is reflected in the design and interface, which makes it as simple as possible to communicate with other users. There are plenty of icons and drop-down menus to help make things as simple as possible. And from your personal dashboard, you are just a click away from pretty much everything you could want, including your mail, the search function and the activity stream, which conveniently keeps a record of all your interactions. If you are a little nervous to contact other users, then the “ice breakers” should help you get started. Meanwhile, deciding who is right for you is made easier by the well-constructed profile snippets which summarize other members at a glance. And of course, there is also a very good Cupid.com smartphone app to keep you in touch wherever you are. There are two approaches you can take to finding a match – Get someone else to do it, or doing it yourself so if you prefer a matchmaker conduct the search process, then read our review of ProfessionalMatch.com. It is the place to be with professional matchmakers on hand. However, Cupid also provides great options. The site will automatically generate potential matches – “Special 7” hands you seven possibilities each day in your inbox, while “Daily Top” also suggests the very best matches. However, if you want to conduct a manual search, the basic search lets you cast a wide net by searching via broad categories such as age and location. The advanced search though allows you to tick boxes related to lifestyle and physical appearance which will help hone in on your dream date. Cupid.com is an excellent all round dating site, which really cuts to the chase of finding someone special. It is a very well-designed site which includes the right features to make it easy to communicate and interact with other people. And of course, women have an advantage as it is absolutely free for them. This is a site which will keep you entertained and engaged while matching you with a great date. An excellent option which is highly recommended.